Springtails are listed in the BugLady’s references (many of which are getting a bit long in the tooth) as primitive, wingless insects in the order Collembola. At present they have lost the coveted Insect Status, and the best they can do these days is “insect-like,” but they are sometimes elevated to their own class Collembola. Their metamorphosis is described as “primitive” (or none). They are ancient, having leapt about upon the earth longer than cockroaches. There are springtail fossils dating back 400 million years; if you consider them insects, these are the oldest insect fossils known. Much of their life history is unknown, and their agendas are a mystery. Springtails come in both Aquatic and Terrestrial. Aquatic springtails mill around on the surface film of quiet waters (including vernal ponds) in rafts made up of thousands of individuals. Unwettable, they may dive and spend some time under water. The terrestrial species stick to moist habitats, wingless, 3-millimeter-short critters moving through the damp litter of the forest floor. One species, the aptly named Snow Flea, can be seen on snow in late winter—pepper-like specks that leap into the air (onto your hand if you hold it close enough) from the snow’s surface (but they eluded the BugLady’s camera this winter). Sometimes snow fleas gather at maple sap buckets. The early, warm days of spring end the springtails’ winter hibernation; in fact, some people call them the first “insects” of spring. The BugLady has a color slide of springtails that she took one early spring day as the snow was melting. 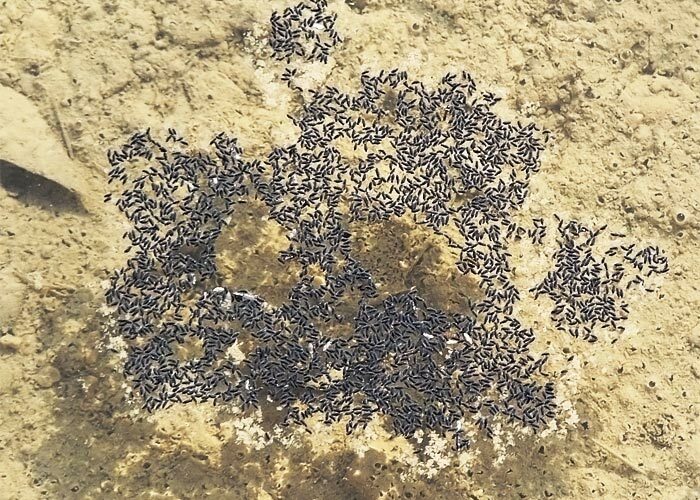 An uncountable mass of blue-gray springtails had crawled out from under the leaf litter and covered a damp rock. On a newly-thawed forest floor, a horde may surface and crawl for days, covering twenty feet before disappearing under the wet leaves again, and Donald W. Stokes, in A Guide to Observing Insect Lives, says that these groups may number from a half million to a million springtails. The springtails in the photo look like they were on a similar outing, which ended in lemming-like disaster in a rain puddle. Many species have hook-shaped appendages for leaping. Two modified legs on the final body segment form a forked “spring” called a furcula that is normally held snug against the body with a clasp called a tenaculum. When the clasp is released, the “spring” snaps open against the ground (like an upside-down mousetrap), thrusting the snow flea into the air. “Spring.” “Tail.” Get it? Collembola means glue peg, a reference to a small, tubular structure on the underside of the abdomen just in back of the legs. Springtails use this “peg” to grip slippery surfaces; they also seem to absorb moisture through it and it may have a respiratory function. They are vegetarians—eaters of algae and decaying plant and animal material, pollen and leaf mold. Aquatic springtails are eaten by fish. Some consider these almost invisible critters to be one of the most common of land “insects.” They put on a great show, but a tiny one, so look sharp.